The acute-phase reactant C-reactive protein (CRP) increases rapidly during an infection. We tested the hypothesis that chronic low-level increases in CRP are associated with an increased risk of infectious disease. We studied 9660 individuals from a prospective general population cohort, including 3592 in whom infectious disease developed, and another 60 896 individuals from a cross-sectional general population study, of whom 13 332 developed infectious disease; 55% were women, and the mean age was 57 years. Hospital diagnoses of infections in 1977–2010 were based on International Classification of Diseases–coded discharge records from the national Danish Patient Registry. We measured CRP concentrations and conducted genotyping for 4 CRP polymorphisms that increase CRP. Individuals with CRP >10 mg/L were excluded because of possible ongoing infection at the time of testing. Individuals with CRP >3 mg/L had 1.2 and 1.7 times increased risk of infectious disease, in the prospective general population cohort and the cross-sectional general population study, respectively, compared with individuals with CRP <1 mg/L. In the combined populations, individuals in the highest CRP tertile (compared with the lowest) had an increased risk of bacterial diseases (hazard ratio 1.7, 95% CI 1.6–1.8), but not viral, mycosis, and parasitic diseases. 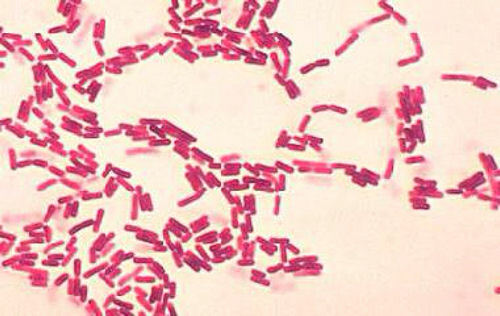 The increased risk was mainly carried by pneumonia, sepsis, and particularly gram-negative infections. None of the genotype combinations examined conferred an increased risk of infectious disease. Chronic low-level CRP increases were associated with increased risk of bacterial infections, gram-negative infections in particular. Genotypes associated with increases in CRP were not associated with increased risk of infection.